Harding (population 150) is located in north central Illinois in LaSalle County, about five miles south of Earlville, seven miles west of Serena, and ten miles north of the county seat, Ottawa. As a rural community, Harding only measures abouit three blocks long and three blocks wide with a church, a school, and a community center to go along with the homes that are there. County Highway 1 (aka Wesley J. Freebairn Highway or the Harding Blacktop) brings people into town from either US 34 to the north by Earlville, or from the junction of US 52 and Illinois 23 at the south. The Crooked Creek Run meanders its way nearby as does Indian Creek. The area welcomed settlers as early as 1830, but they were driven away in 1832 due to the Black Hawk War and an infamous tale called "The Indian Creek Massacre," where 15 men, women, and children were killed by a group of Indians. Another group of settlers came to the area within the next two years, led by E. Z. Allen in 1834, along with the Rev. Wesley Batcheller (1836), and the Rev. Charles Harding (for whom the village is named, who arrived in 1843) and they were able to form the community that still stands today. Hardng's first school was built in 1839, and Rev. Batcheller was the first teacher. The post office was established a year later and Freedom Township (where Harding is located) was organized in 1850. We are uncertain as to when Harding began to offer high school courses to its grade school graduates, but the practice stopped following the 1941-42 school year under the guidance of principal Chuck Markman. Students had the option of finishing their work towards a high school diploma at Earlville, Serena, or at Ottawa. Today's high-school aged students are part of the Serena school district, as a grade school remains at the east edge of the village. Part of the building that high school students attended still remains with a newer addition that was added within the past five to ten years. Harding Gymnasium 2012 - Former HS Gym? It is believed that the school offered some sports to its students, along with other activities such as dances, parties, and the like. 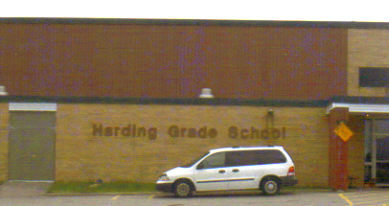 There are no records of any hardware won by Harding in an IHSA state tournament series on the Serena High School page (http://www.ihsa.org/school/records/sum1914.htm). If you know of anything, please contact us at the addresses listed below. We have been told that the community had an semi-pro basketball team called the Harding Orioles, but that team had no connection with the school. One of the school's best-known alumni was former Illinois State Representative Betty Hoxsey, who served the area in Springfield in the 1970's. We would like to thank former students Stanley Wright and Norman Simpson for their help in volunteering information about this entry, and to former Serena High School basketball coach Al Stegman for lending some facts as well.